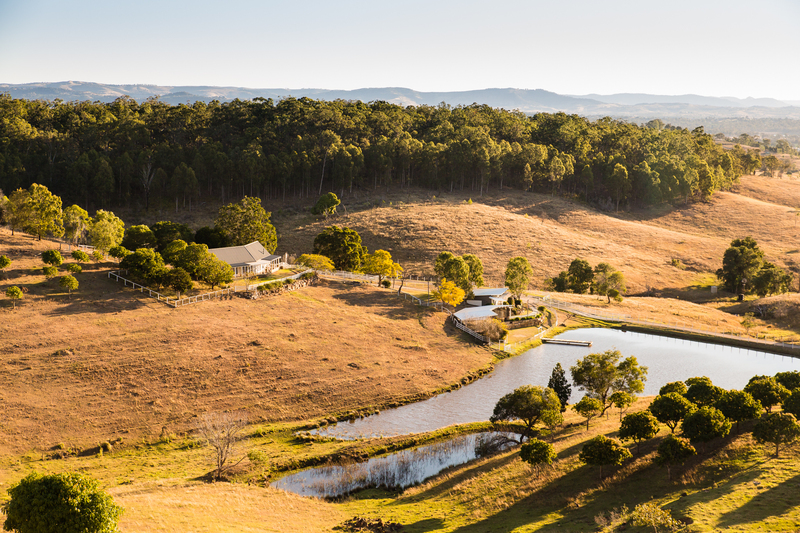 We are very excited to share some more of the photos that photographer Dallas Moy captured on her recent stay at Branell Homestead – this time of the luxury cabins and the spectacular view they offer over the Lockyer Valley. Dallas is a seasoned photographer and has travelled extensively with her business Dallas Love Photography, but had an immediate connection with our property. If you missed our post last time, make sure you go and check it out, because Dallas is certainly one super talented photographer! You can also check out the images from the last wedding Dallas Love Photography shoot at Branell Homestead here. The hillside cabins have a modern style with windows on either side of the living space, thus never hiding the views. The three bedroom cabins have a clever layout where each room is quite private but also allows for so much outdoor and indoor space to relax. A real treat is the swinging-chair on the verandah – I’m sure the most coveted spot to be! My husband and I spent three days soaking in the sun at Branell Homestead and snapping photos around the property to share with you! Each of these days ended watching the sunset either on the jetty, Homestead veranda, or hillside cabin with the bird’s eye view of the valley. We even caught a full moon rise over the cabins, which was pretty spectacular. Branell offers hillside cabins and Homestead Bed and Breakfast accommodation. Both are new builds and are bathed in light from dawn to dusk. However, both are quite different. The cabins are styled in a cozy modern fashion, while the Homestead has a wonderful vintage feel. We were thrilled to stay in the Homestead for our visit to Branell – just our style… with genuine Aussie heritage and filled with antiques but also includes all the modern conveniences such as a home theatre. In the mornings and evenings we always found ourselves sitting out on the verandah, staring out over the landscape with the resident cheeky magpie. I’m relatively new to Australia (immigrated from America as I married an Aussie) so I’ve been on a path of discovery and uncovering Queensland’s gems. I fell in love with Branell the moment I drove down the winding white fenced driveway and saw the rolling hills leading into the valley. I had yet to even see the reflection pond and jetty (I had to look up Aussie word for dock LOL!) or just how vast the hillside view would become once I reached the Homestead. For a wedding, Branell is a one-stop shop for a variety of portrait settings. The old hay shed has a romantic rustic appeal – especially at sunset with newlyweds in around the hay… The surrounding mature trees (with swing) are also beautiful. There is no escaping those rolling hillsides at sunset though! As a wedding photographer, the hardest part is choosing between photographing the couple on the jetty, mango grove hillside with reflection pond view, the large tree in the field with waving grass or that romantic hay shed! I am looking forward to coming back and sharing some of the new amazing spots we’ve found with another bride and groom. Are you puzzled by all of the wedding lingo everyone is throwing at you? It sure can be daunting when you start planning your day. To get you on your way, we have put together some examples of the different types of lighting you could consider. Nothing sets the mood and ambience for your wedding quite like lighting. Whether it is some twinkling fairy lights, a luxurious chandelier or naked candle flames, lighting can become one of the most important features to turn your space into something unique. The selection of the photographs below are only a small sample of what you can achieve. A couple of these images are from previous weddings at Branell, but most have been sourced online to give you an overall snapshot. At Branell, we will work with you to ensure that you achieve your ultimate style. The only thing we ask when you are hanging your lighting is that you do not hammer anything into our walls. Fishing line, clear cable ties and the transparent 3M hooks are very popular methods. One other thing to be mindful of is the type of bulb – make sure you look for a supplier that offers LED bulbs because these use hardly any power at all. Fairy lights – Whether they are hanging from the ceiling, a tree, in mason jars or are used to create an indoor or outdoor canopy of stars – everyone loves a good display of twinkling fairy lights. Festoon Lighting – this can also be referred to as globe strings. Giving a retro feel, this style of lighting is fast becoming the most popular with couples. It is versatile and can be draped, twisted or hung vertically. Lanterns – A fun and effective way to set the mood. Lanterns come in a number of sizes and shapes and are very light, so they are easy to hang. Don’t think you are limited to white/warm yellow, try adding small bursts of colour. Table Centrepieces – A personal touch. Table lanterns, clusters of candles, tea lights and jars – your options are limitless. You could also look at creating these yourself. The colour gold screams success, achievement and triumph. Associated with luxury and quality, prestige and sophistication, value and elegance, the psychology of this colour implies affluence, material wealth and extravagance. It is linked to masculine energy and the power of the sun, compared to silver which is associated with feminine energy and the sensitivity of the moon. If metallic is your thing, the below blog is magic. It has a mixture of classic and new age ideas with some top photography! We have also included some of our own photos below. Colour or neutral palettes – both can look amazing. Check out the image collections we have included below. More and more couples are choosing to use a burst of colour for their weddings. And not just one colour, but a rainbow collection. This can look very effective (especially in your photos) and really sets the mood for a celebration! Branell Homestead has sourced all of the images from a range of websites online. Tell us a little about your business… Baked By Brooke is my home-based business, baking all things sweet, decadent and delicious! I truly enjoy turning the simplest of ingredients into something that makes you say “mmm, yum”, before you know the words have even come out of your mouth. My specialties are mudcakes and cupcakes, made using good old-fashioned recipes – some of which have been in my family for years. I bake with locally sourced ingredients whenever possible and the eggs I use come from the happiest, most free-range chickens you will ever find, from a farm close by in Gatton. When did you decide cakes were your passion? Baking is something I enjoyed from the time I was old enough to lick the beaters in my Mum’s kitchen! Growing up, there would always be home baked afternoon teas waiting for my siblings and I after school. Mum taught me how to bake in primary school and I’ve adored it ever since! I first tried making a decorative cake when I had no idea what to get my (now) husband for his birthday years ago. He is a photographer, so I made him a cake in the shape of a camera. My “trial” cake worked so well that he got his cake a week early! What distinguishes you from your competitors? I’ve often been complimented on my cakes not only looking great, but tasting great as well. I’ve heard so many disappointing stories of cakes for special occasions that looked amazing, but were dry or bland to eat, and left on the plate. All my cakes, and buttercreams are made from scratch. Packet mixes and pre-mixes would be quicker, but they taste nothing like the real thing! Favourite flavour? I have to admit I like cake mixture more than baked cake! It’s a little hard to give out scoops of cake batter at a party though, so when I’m selecting a flavour for my own celebration cakes, I go for cookie dough cheesecake or a mocha mudcake. 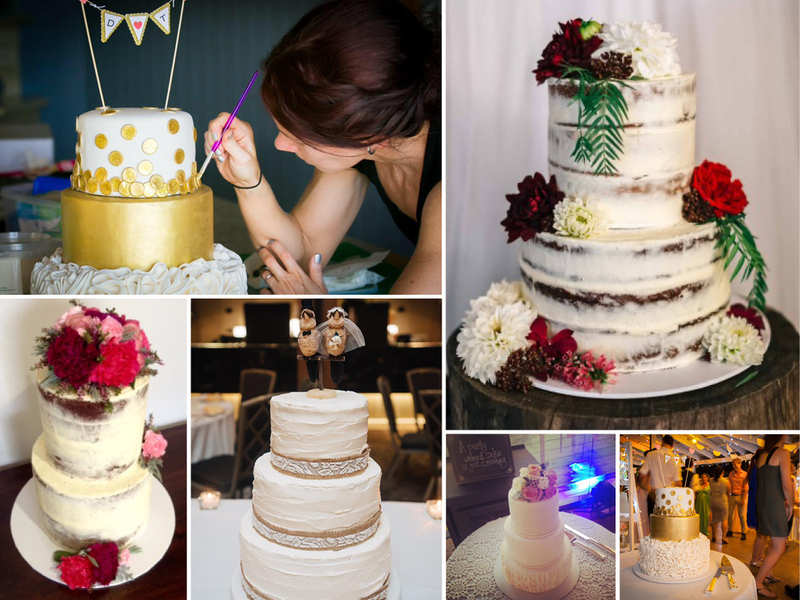 What advice would you give couple when thinking about a cake for their wedding? Firstly “It’s what’s on the inside that counts”. There are some stunning cakes that look smooth, elegant and classy, that are decorated with fondant icing (that’s the smooth icing you see on many wedding cakes), but do you like the taste of it? Many couples and their guests peel it off and eat just the cake – so why pay for something that you won’t eat?! Consider other styles and designs, too. Secondly, think about how your cake will be transported and stored leading up to your event or wedding. It only takes minutes in a warm car or room for a cake to become a hot mess, so plan ahead and crank the air-con in advance! Finally, I won’t use the line that the secret ingredient in a good cake is love, but you can tell when a cake maker loves what they do, and this shines through in the taste, texture and appearance of your cake. Now don’t you wish you had a piece of one of Brooke’s cakes to go with your cup of tea! You can contact Brooke via her Facebook page or email. If you want to taste test some of her creations, she has a cupcake stall at the Laidley markets every Friday. There is nothing like a punch of yellow to make you feel happy and positive! Often teamed with navy blue and/or grey, it can create a very smart palette for your wedding. We have found the below information on a great website called Bride Online. Yellow: Generally symbolises wisdom, happiness and intellectual energy. Yellow is also a very imaginative colour and chosen by those seeking self-fulfillment and adventure. People with good senses of humour often tend towards yellow and other personality traits yellow can represent are curiosity, awareness, and those who are driven and focused. Light yellow: Intellect, joy and freshness.